The average teacher pay in Idaho dropped by more than $200 from 2012-13 to 2013-14 — a decrease that the state’s teachers’ union can’t explain. On average, only two states pay their teachers less than Idaho. A March 10 hearing on a teacher career ladder bill drew dozens of teachers to the Statehouse to testify. A new version of the bill passed the House Monday. But meanwhile, pay appeared to increase for Idaho “instructional staff,” including counselors, principals and curriculum specialists. These mixed results came from a National Education Association study released this month. And the news comes as Idaho legislators and education policymakers continue debating a $125.5 million plan to increase teacher pay. On average, Idaho’s teacher pay fell from $44,669 in 2012-13 to $44,465 in 2013-14. That allowed Oklahoma to leapfrog Idaho into the No. 48 spot nationally — basically, by doing next to nothing. Oklahoma boosted its average teacher pay by only $176, a .4 percent increase. Idaho now ranks No. 49 among all states and the District of Columbia, ahead of only Mississippi and South Dakota. In 2013-14, public school teachers in the U.S. made an average salary of $56,610, leaving Idaho at about 79 percent of the national average. Idaho’s drop in teacher pay was not unique — and at less than 0.5 percent, it wasn’t the steepest decrease nationally. Average pay dropped in a dozen states, including two of Idaho’s neighbors, Nevada and Wyoming. This is a larger employee sample, and it does include teachers. It also includes non-teaching jobs — such as curriculum specialists, guidance counselors and librarians. Principals and assistant principals are in this mix as well; district superintendents and deputy superintendents are not. According to the NEA’s estimates, the average salary for Idaho instructional staff was $53,088 — about 19 percent higher than the average pay for teachers alone. Typically, figures for instructional staff pay come in higher than teacher pay figures, NEA spokesman Robert Glenn said. Meanwhile, the NEA estimates that, overall, Idaho’s average instructional staff salary increased by 2.4 percent, despite the fact that teacher salaries decreased from 2012-13 to 2013-14. However, these are estimates — unlike the teacher pay statistics, which are based on “actuals,” Glenn said. The State Department of Education reported the teacher pay numbers to the NEA, which incorporated the figures in this month’s report. Teacher pay has been one of the most heated topics of the 2015 legislative session — and a major piece of unfinished business, as the session continues in its 11th week. A $125.5 million career ladder bill to boost teacher pay passed the House Monday, and the Senate Education Committee is scheduled to discuss the plan Wednesday afternoon. This third version of a career ladder bill has received unanimous support from education groups, while the IEA and many teachers testified against the original version of the bill. The career ladder would boost teacher pay — for veteran teachers, and for new teachers making the state minimum of $31,750. The increases would kick in over five years. For “residency” teachers in their first three years in the profession, pay would increase to $37,000 to $39,000. More experienced teachers would receive $42,500 to $50,000. The career ladder only sets state funding for teacher pay; salaries are still negotiated at the district level. Supporters of the career ladder — including Gov. Butch Otter’s task force — have pushed for pay raises to help Idaho recruit and retain quality teachers. The NEA’s numbers reinforce a recurring point in the teacher pay debate: In 2013-14, Idaho teacher pay lagged behind all of its neighboring states. Teacher pay isn’t the only factor in recruitment and retention, said Nettinga, but it is an important factor. 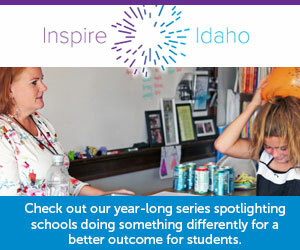 “We hope the acknowledgement of the importance of teacher recruitment and retention and the legislature’s commitment to significantly increase teacher salaries in Idaho is a first step toward recognizing the important contribution Idaho’s teachers make to our state,” she said. The National Education Association’s numbers are dated — but they suggest Idaho’s starting teacher salaries lag behind neighboring states. Gov. Brad Little has proposed boosting the minimum salary to $40,000. In the 30-second ad, the state’s largest teachers’ union says incumbent Sherri Ybarra “can’t be trusted” to manage Idaho schools. For the second time this year, the teachers’ union has thrown its support behind a prominent Republican.